The world looks on America as something very different than it really is. Much of what is told of America, both good and bad, is simply as Donald Trump says, “fake news.” Americans themselves know little about America. Few travel within their own country. America, you see, if 50 little countries, some like California or Florida or Texas, a virtual “Europe” in themselves, with regions unidentifiable as part of anything at all. Keeping America divided has been a game for a long time, perhaps since the earliest beginnings when great corporations like the Virginia Company, financed by Europe’s banking elites, unleashed Europe’s excess population, and Europe’s military prowess as well, on an unsuspecting population of 10 million native Americans who, two centuries later, would become a remnant of walking ghosts. Today I was sent a documentary on Seattle, Washington filmed by KOMO News, a local television station. Seattle has long been seen by other Americans as a gleaming city, moderate weather, startlingly robust economy, mountains and oceans, pure vistas, a cultural mecca that openly discourages even moderately well-to-do professionals from settling there. But that changed. You see, the rest of America has become a toilet. Cultural degeneration, drugs, economic disaster, a nation with untreated mentally ill, tens of millions of addicts and the largest prison population in the world couldn’t hide it forever. The “great toilet” of America had to “flush” sometime and when it did, certain cities, bastions of permissiveness and liberal values, where there to accept the effluent. 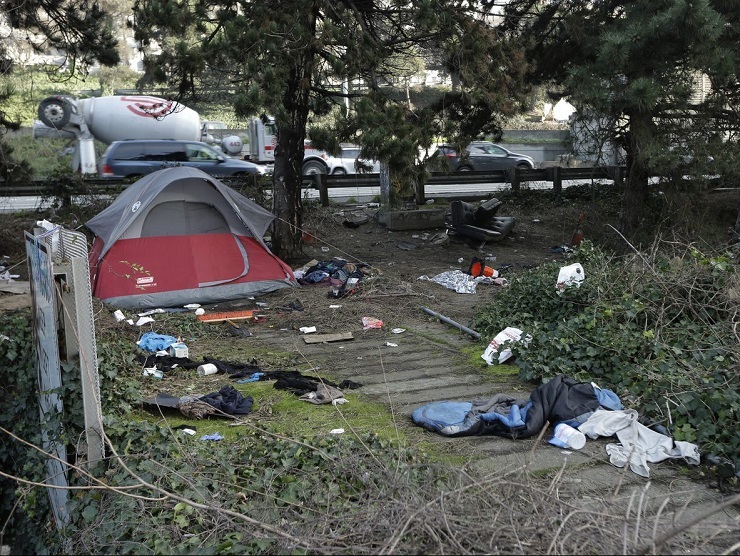 Among those, San Francisco and Seattle, now America’s leading cities in property crime, addiction and homelessness. These are also cities where a moderate working-class home can cost $1 million. I sat through an hour of trash heaps and streets lined with the shadows of human beings, who have flocked to “Free-Attle,” the name that has spread across a secret network of addicts, petty criminals and homeless that have been told that laws aren’t enforced, police are helpless, food and medical care is free and the local population exists only to be stolen from and fed upon. Yes, people who have lived their lives writing code and playing video games have been handed an entire region of the United States to rule as they will. Driving the politics of ignorance that has led to the destruction of what had been two of the planet’s greatest cities is the tech giants, Google, Facebook, Microsoft and a thousand others. America educated a generation of programmers and “fake entrepreneurs,” and created a hell from heaven and, as we are also noting, a New World Order of surveillance and social manipulation. Their efforts can be seen in how they treat where they live and work, cities whose streets teem with endless armies of screaming paranoids, “meth-heads” and “stoners.” Twenty years ago, the people of San Francisco got used to seeing AIDS victims dying on the sidewalks, learned to look away or step over the bodies. One might wonder if the video game industry, that “other” drug culture, along with the insular existence on social media created a mind set where engineering human degeneration might well be considered a competitive sport. Then we have drugs, we can’t forget that. Drugs are a key component to the lives of every American, millions of methamphetamine addicts and tens of millions of opioid addicts, legalized marijuana and a culture based on gratification and ambivalence. The culture of drugs that is now running America had its beginnings long ago. A century ago, heroin was sold over-the-counter as a “relaxant” and pain reliever and cocaine was in soft drinks. When the 1960s arrived, a generation of Americans, driven to rebel against decades of self-righteous repression in the midst of a divided racist culture, was primed for being unleashed. Along with the cultural upheaval of The Beatles and the music revolution came LSD and a general acceptance that altered reality led to human growth. Though this message may well have value, there is little doubt that it opened a floodgate. Drugs had always been the business of America’s “Mainline” families, the Cabots and Astors, or rather the Cabotas and Astorgas were one to trace their real origin to the ancient Sephardic banking consortiums of 16th century Italy. These great shipping families of America’s Northeast, centered around the universities, Harvard and Yale, ran the slaves, carried China’s opium for Britain and profited from every war as “Americans,” just as they had when they funded Napoleon and his foes. As is so often the case, when you open a door, there is so much behind it, lending toward recognizing those who profit from despair and suffering, but our story is a much smaller one today, or is it that small? As it plays out, the story enacted in San Francisco and Seattle is also London and Paris or Berlin. Parents of “baby boomers” were the veterans of World War II or survivors of the Great Depression who managed to put their lives together at age 50, starting families late in life. When I was a child growing up in Detroit, most of my friends had fathers old enough to be World War I veterans, dropping like flies from heart attacks and years of cigarettes and working in factories laden with the stench of carcinogens. Washing one’s hands with carbon tetrachloride (Google never heard of it) was common. For Americans, the rural South and West, the teeming cities, the only hedge against cultural decay and rampant crime is economic isolation. For that, moderate to great wealth is required or to simply stay silent. Americans share, though many are unaware of this, the suffering that America’s global policies inflict on others. America’s economic wars, Russia, Syria, Venezuela, China, and the list grows hourly, our misguided war on terror, have lowered standards of living around the world, generally assumed to foster unrest and dissatisfaction. Why then is it being done at home? That answer is also simple, to foster unrest and dissatisfaction. One might ask why a nation would subject itself, its own people, particularly those who blindly support political leaders whose policies are destructive to their own supporters and constituents, to a life of hopelessness and potential radicalization. Why would a nation assume political and economic policies that put millions on the streets to parasite off of and embattle those around them fostering anarchy and crime. The end result of what we have seen is telling. Behind it is fear, as in the lessons many Israeli’s have learned, that walling out the Palestinians has, in truth walls them in. There is no being “above” suffering. When suffering is engineered, be it greed or social experimentation, perhaps those choosing lives of suffering for others might be held to task.